Similar coats are a symbol of learning in Argentina and Uruguay, where they are worn by both students and teachers in state schools. In Tunisia and Mozambique, teachers wear white coats to protect their street clothes from chalk. The term is also used as verbal shorthand for psychiatric orderlies or other personnel and may be used, in a usually jocular manner, to imply someone's lunacy or paranoia. Until the mid-1920s, students who were examining cadavers would wear black lab coats to show respect for the dead. Black lab coats were used in early biomedical and microbiology laboratories. The "whiteness" and "pureness" concepts that were established in medicine pervaded that environment at the end of the 19th and beginning of the 20th centuries and physicians changed the black for the white coat. When used in the laboratory, lab coats protect against accidental spills, e.g., acids. In this case they usually have long sleeves and are made of an absorbent material, such as cotton, so that the user can be protected from the chemical. Some lab coats have buttons or elastic at the end of the sleeves, to secure them around the wrist so that they do not hang into containers of chemicals. 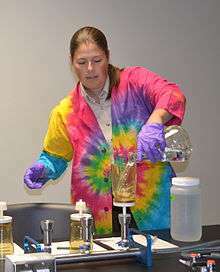 Short-sleeved lab coats also exist where protection from substances such as acid is not necessary, and are favoured by certain scientists, such as microbiologists, avoiding the problem of hanging sleeves altogether, combined with the ease of washing the forearms (an important consideration in microbiology). 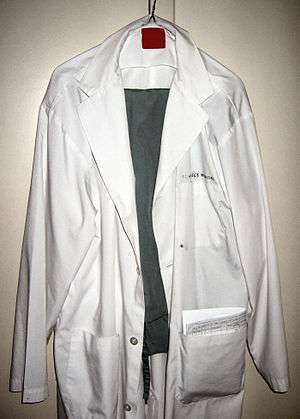 White coats which resemble lab coats are worn by students and teachers of most public primary schools as a daily uniform in countries like Argentina, Uruguay, Spain, Bolivia and Morocco. It also was formerly worn in past decades in Paraguay and Chile. ↑ Jones VA (1999). "The White Coat: Why not Follow Suit?". JAMA. 281: 478. doi:10.1001/jama.281.5.478-jms0203-5-1. ↑ Andre Picard (2012-07-02). "Why do physicians wear white lab coats?". The Globe and Mail. Retrieved 2012-11-10. ↑ Hochberg, Mark (April 2007). "The Doctor's White Coat--an Historical Perspective". Virtual Mentor: American Medical Association Journal of Ethics. 9 (4): 310–314. doi:10.1001/virtualmentor.2007.9.4.mhst1-0704. PMID 23217976. Retrieved 26 November 2014. 1 2 "Doctors 'should wear white coats'". BBC News. 2004-05-13. Retrieved 2006-07-18. ↑ Pierdomenico S, Mezzetti A, Lapenna D, Guglielmi M, Mancini M, Salvatore L, Antidormi T, Costantini F, Cuccurullo F (1995). "'White-coat' hypertension in patients with newly diagnosed hypertension: evaluation of prevalence by ambulatory monitoring and impact on cost of health care.". Eur Heart J. 16 (5): 692–7. PMID 7588903. ↑ Huber SJ (2003). "The white coat ceremony: a contemporary medical ritual". J Med Ethics. 29: 364–366. doi:10.1136/jme.29.6.364. ↑ Treakle, Amy (March 2009). "Bacterial contamination of health care workers' white coats.". American Journal of Infection Control. 37 (2): 101–105. doi:10.1016/j.ajic.2008.03.009. PMC 2892863 . PMID 18834751. ↑ Murphy, Clare. "Death of the doctor's white coat". BBC News. BBC. Retrieved 5 December 2014. ↑ Yao, Laura. "AMA: White Coats Need More Study". The Wall Street Journal. The Wall Street Journal. Retrieved 5 December 2014. ↑ Burden, Marisha; Cervantes, Lilia; Weed, Diane; Keniston, Angela; Price, Connie; Albert, Richard (February 2011). "Newly cleaned physician uniforms and infrequently washed white coats have similar rates of bacterial contamination after an 8-hour workday: A randomized controlled trial". Journal of Hospital Medicine. 6 (4): 177–182. doi:10.1002/jhm.864. PMID 21312328. ↑ Subcommittee: F23.40. "New Specification for Healthcare Worker Protective Uniforms". ASTM International. ASTM International. Retrieved 5 December 2014.